Sometimes you need to go on a vacation or getaway that is packed with adventure, that enthralls you and creates dynamic memories for your entire family. But other times, you simply need some "you-time". You need a weekend to focus inward a recuperate from your exhausting day-to-day. Some do this via golf, movies, or reading a book, but may we suggest a more opulent approach? A spa getaway is just what the doctor ordered if you're feeling stressed-out, overworked, or just tired. These are the ten best spa resorts in New York! A scant two hours from Manhattan sits one of New York’s most luxurious retreats: Emerson Resort & Spa. This Catskill Mountains-themed resort is the destination of choice for relaxation-seekers from all over the country, and for good reason. Jump into unadulterated tranquility at Emerson. Whether you’re alone, with a partner, of have a family in tow, Emerson can cater to you. While the kids are off skiing, hiking, biking, tubing, or fishing, head over to the onsite full-service spa for some serenity. The expert staff prides themselves on their ability to diagnose and immediately treat what ails their clients. Get a hot stone massage featuring high-grade essential oils and ancient ritual treatments, and sink into absolute bliss. Go and sample the delicious Woodnotes Grille! Nearby attractions are unforgettable- remember to check out the nearby World’s Largest Kaleidoscope! The six-million acres of Adirondack Park forests are also home to the Whiteface Lodge, a preeminent spa and retreat for anyone seeking a little R&R. While rooms are spacious, rustic, and cozy as they come, you’re reading this list because you’re interested in the spa. And interested you should be, as the spa at Whiteface was ranked among the Top 100 Spas in North America by Condé Nast Traveler. 8,000-feet of pure repose awaits you in the stunning complex, which (they’re pretty sure) will be plenty of space for you to find your Eden, so to speak. Let the knowledgeable staff pamper you with everything from the highly popular Apple Cider Masque & Massage to our HydraFacial MD Premier Facials. There's also a shuttle service to the hotel's private beach club! Beautiful Lake Placid sits only a mile away! A veritable Victorian castle, Mohonk Mountain House is the resort you’ve always dreamed of staying in. From your room, you’ll have an incredible view of Lake Mohonk and the rest of the Hudson Valley. Come and experience the utmost in relaxation! There’s a ton to love at Mohonk Mountain, but perhaps the thing that guests love the most is the award-winning spa. Having recently topped lists in Condé Nast Traveler and Travel + Leisure Magazine, the spa represents the pinnacle of New York grandeur and tranquility. It features 16 restorative treatment rooms, a solarium with stone fireplace, an outdoor heated mineral pool, and a comprehensive fitness center, where you will be pampered within an inch of your life. Get a massage, a facial, or a mud bath - you deserve it! Check out the 18-hole golf course! La Tourelle might sound foreign, but it offers all the familiar amenities you’d expect from a world-class resort (and more). With 52 deluxe rooms and suites available, not to mention the incredible hospitality of the employees (although we did just mention it), a weekend getaway here will be one you won’t soon forget. When you aren’t resting in your pillow-top mattresses or hiking through any of the nearby five state parks, you’ll be achieving absolute serenity at the August Moon Spa. Offering all the services you’d expect of a luxury spa, August Moon also features two tranquility Rooms where you can relax and enjoy cuisine from the delicious onsite restaurant, The Bistro. It’s not heaven- it’s the August Moon Spa at La Tourelle. The farm-to-table bistro serves breakfast, brunch and lunch, and there's a steakhouse. The Resort is 3.4 miles from Downtown! The jewel of the Catskills, Villa Roma blends rustic Italian style with modern American sensibilities. The result is a resort that entrances both body and mind. Jump into a spa day at Villa Roma for the utmost in relaxing luxury. If your body is aching from the stresses of the daily grind, try out warm stone and shiatsu massage from one of the knowledgeable relaxation experts on staff. Then pamper yourself with whatever you like! Take an extended trip to the sauna and sweat out the negative energy, or get a lavender mud wraps and sea salt scrubs to make your skin feel squeaky clean. Just remember it’s your vacation; relax! There are 3 pools, a hot tub and a spa, plus meeting and event space. 11.2 miles from Bethel Woods Center for the Performing Arts and 19.8 miles from Monticello Raceway. 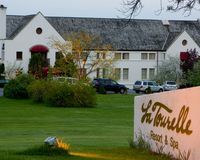 An intimate boutique spa experience awaits nestled in the heart of the beautiful Finger Lakes Region of New York state! The Spa at Gothic Eves features a boutique experience like no other. Whether you're here to relax in a classic treatment or to experience one of a kind "Journey" treatment you're guaranteed to feel brand new and healed. Energy medicine, massages, healing sounds, crystals, aromas, and more elements make your spa experience unforgettable. Take health into your own hands and learn Traditional Chinese Medicine protocols like meridians, chakras and auras. A two-day journey, on focus and self-empowerment or change and acceptance, will teach you the specific techniques to take home for a daily energy routine. The Spa at Inn at Gothic Eves helps shift your consciousness in the midst of daily challenge and struggle with their journey experiences. They help you work your body while you settle your mind. Choose a focus and self-empowerment journey or a change and acceptance one. Rocking Horse Ranch Resort holds the rare distinction of being a relaxing resort for adults that ALSO has plenty to offer kids. Round up your family and head up to Highland for the time of your lives! The sprawling 500-acre property provides a setting where your kids can run wild. While they’re off horseback riding, swimming, or who-knows-what, you’ll be sinking into deep, deep relaxation at the onsite spa. Whether you need a facial or a massage, the spa offers a huge selection of treatments that can be personalized to your EXACT specifications. Your kids will have a fantastic time and (more importantly) you will too! Indoor options include a water park, a fun center with a bounce structure and an archery range. Only 4.7 miles from I-87 and 6.4 miles from the Poughkeepsie train station. As the Finger Lake’s #1 Casino and Hotel, Del Lago Resort & Casino has a massive reputation to live up to. All it takes is one visit to see that it does so- and with flying colors at that! Wherever you’re coming from, however long you plan to stay, there’s only one destination in the Finger Lakes region that gives you everything you expect, and then some. If unparalleled tranquility interests you, you’ll feel better as soon as you walk through the doors of Spa del Lago. Its 14 treatment rooms, full salon, and retail boutique have all the products and services you could ever want in order to make you look and feel like a million bucks. You don’t have to be a hotel guest to treat yourself to a much-deserved day of rest, either- simply drop in or make an appointment to revitalize your body and spirit! You'll leave feeling rejuvenated, reinvigorated, and ready for whatever! There's a total of 205 luxurious rooms, each with beds more comfy than home. August Lodge Cooperstown helps you relax on your vacation! Take advantage of the onsite spa services and indulge in a soothing body treatment or massage. Relax, rejuvenate and recharge your body, mind, and soul. August Lodge Cooperstown's spa menu includes a variety of full body massages to choose from including hot stone massage, Swedish, deep tissue, and reflexology. Try their PerfectSense™ paraffin wax infusions. You will love it! Take advantage of August Lodge Cooperstown's spa specials and enjoy excellent lodging options and discounted massages! Relax, renew and rejuvenate. Stay at the Lodge three consecutive nights and receive a 50% discount off the price of a one hour massage! As full of history as it is opulence, the spa at the Gideon Putnam Hotel will take you, spruce you up, and spit you out a completely different (better) person than when you came in. 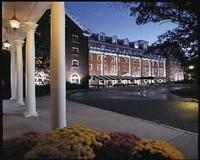 Established in 1935, the Roosevelt Baths & Spa Saratoga Springs spa is just as mind-blowing as it was 80 years ago. Slip into Saratoga’s naturally effervescent water and feel your body begin to heal. The is pumped in from underground springs, then mixed with warm fresh water to a neutral temperature for maximum benefits. There are 42 treatment rooms, of which you’ll have your pick. Massage, facial, whatever you’d like; it’s your vacation, so spend it relaxing in the best way possible! 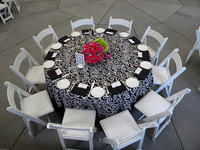 Other amenities include a restaurant with a patio, and over 12,000 sq. ft. of meeting and event space. The resort is only a seven minute walk from Saratoga Performing Arts Center and a scant seven miles from the boutique shops and restaurants of downtown Saratoga. A day at Honor's Haven Resort & Spa is one that begins and ends in serenity. From your colonial room to the ever-congenial staff, one you come you’ll never want to leave. Come and experience the onsite wellness center, EarthMind. Your day-to-day is filled with stresses and difficulties that take a toll on mind, body, and spirit. Let Earthmind Wellness facilitate your recovery through holistic techniques and activities. This style of healing is based on East Asian energy principles and integrated wellness services such as energy yoga, tai chi, and meditation. The dedicated team of professionals will be your dedicated instructors, so as to better focus on your personal empowerment, self-development, and progressive holistic wellbeing. The relaxation is practically pungent! There's also 48,000 square feet of meeting space. When a resort has earned the prestigious AAA Four-Diamond, “Exceptional” award for over 32 consecutive years (the longest of all Lake Placid hotels), they must be doing something right. The spa at Mirror Lake Inn is just one of those things. The onsite spa has a variety of ways for you to achieve the pinnacle of relaxation. Warm up in the Vichy shower while soaking yourself in Phytomer marine-based products. There are also designated men’s and women’s sanctuaries, featuring dedicated specialists for a plethora of treatments. On the women’s side, go get a manicure or a pedicure, then get a new style at the salon. Men are welcomed into the “Gentlemen’s Corner”, which features a selection of services skewed towards them. Amenities include a 60-foot indoor pool, heated outdoor pool, fitness center and restaurant. The resort is located 21 miles south of Whiteface Mountain!